The constant aroma of roasted beans. Free caffeinated beverages. Other coffee-related perks. Like a Starbucks cup, this barista job’s got your name on it. But wait just a second. There are dozens - if not hundreds! - of applicants for each coffeehouse position. For the employer, it’s like having a bottomless mug. Hiring managers have a latte choose from. How can we make your barista resume stand out to score you that interview? We’ll walk through this together, step by step. You’ll soon have a barista resume and cover letter that rises to the top, as cream always does. Barista resume & cover letter examples better than 9 out of 10 others. How to write a barista resume that will land you more interviews. Tips and examples of how to put skills and achievements on a barista resume. How to describe your experience on a resume for a barista to get any job you want. 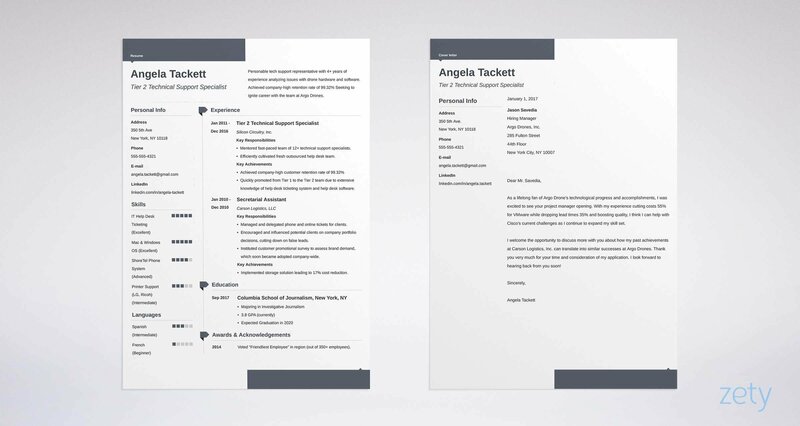 Here's a sample resume for a barista made using our resume builder. Barista Resume Examples - See more templates and create your resume here. What’s the Best Format for a Barista Resume? Most of the time, cafe hiring managers won’t read your whole resume. The only thing shorter is how quickly you can down a doppio. What does that mean for you? You need the right barista resume format. Luckily, it’s not as difficult as it sounds. Depending on your past cafe work history, there are two main ways to go about this. Trade Trifles & Trivia: What is a barista, exactly? An Italian word, the barista definition literally means ‘bartender.’ A barista generally refers to a person who works at a coffee shop who prepares and serves coffee and espresso-based beverages. Looking for advice on how to make a resume and cover letter for other food service jobs? Check out our guides on how to make a fast food resume, how to make a chef resume, and how to make a waiter or waitress resume. Been behind a counter grinding roasted beans before? Wonderful! You’ve got a venti-sized advantage. The reverse-chronological format is best for your experienced barista resume. Why is that? This format emphasizes your barista duties, experience, and work history. You’ll list your most recent work positions first, and go back through past jobs in reverse-chronological order from there. As the most standard format, it tends to be the easiest to read and scan. But, how can you format no-experience resumes for baristas? You might not have experience for this java job, but you have experience relevant to the job. On a first-time barista resume, you’ll still list other jobs you’ve held in reverse-chronological order. However, this time you won’t just talk about your demitasse duties and responsibilities. Rather, you’ll highlight relevant skills and achievements from past jobs. Feature them in bullet points, neatly aligned like the muffins in the dessert case. List them under relevant subheadings like: Food Service Skills. Pick and choose transferable skills to match the job description for barista resumes from the ad. Next, save your barista resume as a PDF. The PDF format keeps the layout in shape, like the skinny latte format keeps us in shape. Pro Tip: Check the job posting to make sure PDFs are OK. A PDF might cause the Applicant Tracking Systems (ATS) to back up like the line at Dunkin’ Donuts on a Monday morning. The ATS scans for keywords, and if it can’t read your file, it’ll assume you are not coffeehouse material. Barista Resume Summary or Resume Objective? You want to catch their eye. You want to make an impression. You need a good barista resume objective or a professional resume summary. But which one? Don’t worry! We’ll go over these two now, and you’ll be able to pick the best one for you. You’re the greatest grinder in the galaxy. Personable barista with 2+ years’ expertise in a fast-paced cafe environment. Achieved district-highest customer satisfaction rating according to receipt surveys (98.16%). Seeking to advance coffee brewing career by growing with the team at Peet’s Coffee. I have been a coffee shop barista for the last 2 years. 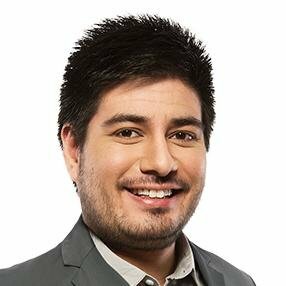 In addition to my knowledge of coffee-making appliances, brewing techniques, and food and beverage recipes, I also carried out various front-of-house duties (e.g., taking orders, dispatching beverages) during busy hours. Take the “Wrong” one: it’s great that you were able to handle making the pumpkin spice lattes in the back and also serving them up front. However - and no disrespect - but who cares? You’re just listing your regular tasks as if they were accomplishments, which they aren’t. In the “Right” example, we give evidence of our achievements and experience. This is the better way of how to make a barista job sound good on a resume. Trade Trifles & Trivia: Barista pronunciation: buh-REE-stuh [bəˈriːstə]. The closest you’ve come to being a barista is when you brought your coworkers coffee. Friendly and responsible high school senior with 5+ years coffee-making experience for large family with demanding parents. Obtained highest grades in two different Home Ec classes (100%). Seeking to jumpstart my career by growing with the Starbucks team. I am a high school senior eager to start my first job. I don’t have experience in a cafe, but my family says that I make decent coffee. I am also highly motivated because I want to earn enough for the down payment on my first car. Starbucks is taking a bigger chance by hiring a barista without experience. You’ll need to show them that you have what it takes. In the “Right” one, we used some transferable skills from a high school class and family. The “Wrong” one doesn’t show enough to hold the hiring manager’s eye. Pro Tip: Personalize your barista resume example by dropping the cafe’s name into your resume summary or objective. Utica Coffee Roasting Co’s slogan - “Wake the hell up!” - is also exactly the effect we want your creative barista resume to have on the hiring manager. But - how do we do that? You’re the best bean-brewing barista on the boulevard. Held one or more barista jobs before? Great! You’ve got a head start. Still, pick the best barista responsibilities that match the cafe’s interests. Coached several types of servers on Starbucks barista duties and managed Starbucks barista training. Made coffee and other beverages. Responsible for serving customers’ orders. The “wrong” example seems fine, at first - we explained our duties and tasks. However, that’s just it: those were our everyday barista duties and responsibilities. In the “right” example, we itemized our barista duties with more detail, and then we included achievement(s) with quantifiable numbers for the win. That’s how to get hired at Starbucks or Dunkin’ Donuts. Trade Trifles & Trivia: What’s a male barista called? A barista. That’s right; the Italian word is the same for both male and female. However, the Italian plural of barista is baristi for men and bariste for women; in English, though, we just say baristas. The bulk of your coffee-making experience comes from waiting for a barista to serve yours each morning. Never been a barista before? Relax. We just need to find a way to show the boss that you’re worth your beans. Assisted with preparing and promoting weekly specials to guests. Influenced customers with decor-pairing decisions based on home, taste, and palette. At first, working in the home decor department of a retail store doesn’t seem anything like a Starbucks barista job. But, we played up those duties and achievements which translate well into a barista resume - whether for Starbucks job applications or for Coffee Bean applications. Pro Tip: Take some time to think about your past jobs. How can I make barista resume duties and descriptions that impress? Well, which areas relate best to having strong barista coffee skills? Pick those for your barista resume. Is Your Education Section Lukewarm? It Might Be. You’d better think again. The education section is a valuable part of perfect barista resume examples. In the case of those without experience, the education section becomes the most important. So, how should we put your education on your full- or part-time barista resume? As you can see in this snippet on how to apply at Starbucks, education is rarely a requirement on a barista resume for coffee shop positions. If you have completed a degree, it’s better to skip listing your high school. Pro Tip: On your Peet’s or Starbucks barista resume, only include your GPA if it is as close to 4.0 as possible. Too low will hurt instead of help. We don’t want that! We’ll just find a great way to espresso yourself. We need to play up your skills and include the perfect ones for the best barista resume. A skills section on your resume for baristas is like the milk you add to your coffee beverages - important, but only the right ones. You can’t give them whole milk if they can only drink soy. Also, not too much and not too little. Like a flavorful blend, we want the right balance. First, let’s make a list of some generic hard and soft skills to put on a resume for baristas. Hard skills are specific abilities and know-how (e.g., Bean Grinder 5000, cafe prep duties). Soft barista resume skills are self-developed, life-learned attributes (e.g., safety consciousness, adaptability). What are some skills for barista resumes? But! These are good skills for a resume - for average barista resume examples. You’re not average, right? Neither should your resume for barista be. To make your resume unique, we can’t just list these generic skills relevant to baristas. Let’s replace this Americano with a bolder caffè ristretto. It’s time to browse the job listing like the menu board, but instead of finding the drink we crave, we will underline resume keywords that match the cafe manager’s appetite. Pro Tip: Try this: Type a bunch of your skills for baristas into an Excel column, with a number (1-10) of importance and coffee shop relevance in the adjacent column. Then, filter the worst ones down like a French press until you have the best 5 or 6. See the differences between the two? In the second one, your laziness is obvious - you googled “skills for barista” or “skills resume samples” and stuck them in. In the first one, you look like the order made perfectly with a dollop of whipped cream and a cherry on top - just who the barista manager was looking for. Pro Tip: Do you like coffee? Or do you appreciate java? Relish that joe? Fancy that varnish remover? Use action verbs and colorful words to make your resume more appealing to them. However, watch out for too much flourish and exaggerated descriptions - some recruiters may consider them inappropriate. Contact info, experience, education, objective, skills - you’ve got the essentials. But every other barista applicant does, too. You’ve served up a nice cup of coffee, but how but some sugar and spice and everything nice? Let’s add some salted-caramel to this plain macchiato. We need to sprinkle in a dash of our secret ingredient: extra resume sections. 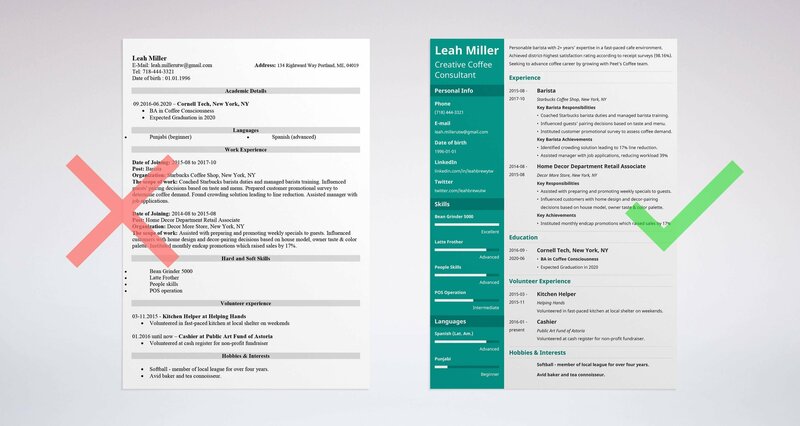 Extra resume sections make your barista resume more unique. This is where you’ll list some relevant things that you’re proud of. You have every right to be proud of these accomplishments - hell, I know I would be. However, they’re not friendly for a coffee shop resume. I’ll go over some of the most popular additional sections for your resume for barista jobs now, along with some better, more relevant examples. Trade Trifles & Trivia: What does a barista do? Well, they serve coffee to tired people. However, in Dubai, Costa Coffee just became the first chain to use drones in assisting the barista - delivering by air a cup to those sunbathing on the nearby beaches! Volunteered in fast-paced kitchen at local shelter. Volunteered at cash register for non-profit fundraiser. I love reading whenever I get the chance. But, as you can guess, it’s not very relevant. Softball - member of local league for over four years. Avid baker and tea connoisseur. The love of baking and teas should show that you are knowledgeable about the other important items on a cafe’s menu after coffee. Placed second in last year’s Bold Blend Brew-off. Know another language? That could be very helpful on a barista resume, and maybe a necessity. Knowing another language is like being able to operate both the cash register up front and the espresso machine behind the line. Don’t turn in a resume with so much blank, white space. Well, you can, but it is like serving a double shot in a venti cup. Only the customer would just complain and ask questions, while the hiring manager will simply put your resume aside. Relevant extra sections on your barista resume are the answer. Pro Tip: Don’t add too many extra sections on your resume for baristas. Add only enough extra sections to fill the rest of the current resume page - not more that it spills over onto a new one. Would you serve a cappuccino without frothing the milk first? No, right? A resume without its cover letter is the same thing - not ready to hand over. You’ve taken your time on your barista resume measuring the ingredients, adding the sweeteners, and mixing it all together. Now we have to brew up a barista cover letter sample before serving it all to the cafe manager. Explain why coffee bean jobs excite you. Drop names - name the hiring manager and cafe to personalize it. When your cappuccino is ready, would you want them to call out, “Hey you!”? Of course not. Neither do cafe hiring managers. Do like Starbucks and other cafes and call them by name in the barista cover letter. Mention something about the coffee shop that you relate with. You dropped their name and caught their attention - now seal the deal with this next personalization. Be witty. Be charming. Be clever. Positively grab their attention - it will mean more than degrees and certifications you list in your enclosed resume for baristas. Pro Tip: Research the cafe and the barista position online and mention something in particular that stands out to you. This is something a resume can’t include and will really catch their eye! Did you know that our resume builder will also help you write a professional cover letter for a barista job? For more advice, read our cover letter tips or find out exactly what to include on a cover letter. How did the hipster burn her tongue? She drank her coffee before it was cool. How did the job seeker burn his chances? He handed in his resume before it was hot. That first one is meant to be funny, but that second one definitely wouldn’t be. Luckily, however, if you’ve followed this guide, you should have a barista resume that is the crème de la crème. Personalize, Personalize, Personalize. Address the hiring manager by name in the cover letter. Mention the coffeehouse in the resume heading. Make yours stand out. You want to join them, so make them need you. Spice up your resume bullet points with action verbs and impressive achievements to wow them. Paint the best picture of yourself. Double- and triple-check. Spend an extra few minutes making sure that your barista resume and cover letter are up to par. Arabica-dabra! You now should have a creative resume for barista jobs that’s brewed to perfection and served just right. Time to attach the final barista cover letter and resume to an email like a paper zarf and send it off. I hope I see you behind the counter the next time I stop in for a coffee! Do you have any questions on how to write a barista resume? Not sure how to describe your skills or achievements? Give us a shout in the comments below (after you’ve been properly caffeinated, please), and we will answer you right away. Thanks for reading!